By the time you read this I’ll be in the tiny fishing village of Port Manec’h in the south of Finistère, near France’s equivalent of Lands’ End, Pointe du Raz. We are here at the invitation of my French friend Dominique who with her husband Philippe owns a lovely holiday cottage in Port Manec’h. What a wonderful opportunity this is! – not only to try and resurrect my rusty French, but also to enjoy the glorious coastal and riverside scenery and the other treasures of Brittany with its turbulent history. I’m hoping, too, that this time spent in the region of Névez will be a great inspiration to me as a writer. The novelist Jean-Luc Banalec sets his Inspector Dupin murder mystery novels in Névez, and says, I am constantly inspired when I’m here…. I write my books here and they are a declaration of love to Brittany. Steeped in the enchanting atmosphere of Brittany and peppered with wry humor, Murder on Brittany Shores: A Mystery is a superbly plotted mystery that marks the return of Jean-Luc Bannalec’s international bestselling series starring the cantankerous, coffee-swigging Commissaire Dupin. Ten miles off the coast of Brittany lie the fabled Glénan Islands. Boasting sparkling white sands and crystal-clear waters, they seem perfectly idyllic, until one day in May, three bodies wash up on shore. At first glance the deaths appear accidental, but as the identities of the victims come to light, Commissaire Dupin is pulled back into action for a case of what seems to be cold-blooded murder. Ever viewed as an outsider in a region full of myths and traditions, Dupin finds himself drawn deep into the history of the land. To get to the bottom of the case, he must tangle with treasure hunters, militant marine biologists, and dangerous divers. The investigation leads him further into the perilous, beautiful world of Glénan, as he discovers that there’s more to the picturesque islands than meets the eye. I hope that when I walk on those white sands in the Glénan archipelago, I’ll be as inspired as Jean-Luc Bannalec, perhaps, for the setting of one of my future novels! On 9th September 2017 on the last day of my Mystical Circles blog tour, fellow blogger Linda Hill published an interview with me on her blog Linda’s Book Bag. This is the final one in a series of nine blog posts, in which I re-publish the stops on my blog tour. I’ll be giving a talk to The Writers Hub in Coventry Central Library on Saturday 4th November 10am. If you’re in Coventry that morning you’ll be very welcome at The Writers Hub meeting – tea, coffee and chat at 10am and then you can hear me speak about ‘The Highs and Lows of the Writing Life’. I’d love to see you there! On 3rd September on the third day of my Mystical Circles blog tour, blogger Rosie Amber hosted a guest post from me on her blog. Recently a fellow blogger piqued my interest with a piece about online book reviews. Amongst the observations she made, she referred to the attitude authors take to their reviews. She noted that many people have different interpretations of the star-ratings. Specifically she mentioned that she had experienced some asking her to take down three star reviews which they interpreted as negative. As an author and reviewer myself, I review every book I read on Amazon and Goodreads. I will give a book 5 stars only if it hooked me, kept me enthralled, made me want to read on, answered the questions the author posed, AND delivered a strong, satisfying end. If all those things above are present, but the end does not satisfy, I will downgrade a star rating. I think you can in some way define an author’s theme, worldview, mindset (at the time of writing, anyway) from the way they choose to end a novel. But having said this, I will admit to a challenge when I came to write the end of my novel Mystical Circles (out in a new edition with a new cover on 5 September). Ideally I would have liked to give two alternative endings, as John Fowles did in his novel The French Lieutenant’s Woman. I don’t like an ending which ties up all the loose strands, and which is unequivocally happy or sad. My ideal ending is bittersweet. As in life, I believe that when all our dreams are fulfilled there will always be other aspects of the situation which have the potential to cause disruption in the future. One of my favourite endings is that to Jane Austen’s Pride and Prejudice, because although the central story question is answered positively, it is also bristling with ironic little hints that life is not necessarily going to run smoothly for the main protagonist hereafter. How I chose to end Mystical Circles was full of challenges because the raison d’etre of the story – a hothouse community called Wheel of Love who have gathered around a charismatic leader to learn how to achieve an ideal existence – derives all its emotional charge and dangerous dynamics from the psychological instability of the group members – and its leader. The situation I outline in the novel – the attempt by a young woman journalist to rescue her younger sister from a mystical cult – could have a number of outcomes. I think the key to a successful ending is that it must satisfy, whether it is happy, sad, tragic or bittersweet. I am conscious, too, that an unsatisfying end can undo much of the good work of an author. As novelists the best we can do is to remain true to ourselves, to what we are trying to say within our stories. Though I admit we often don’t even know what we’re trying to say, until we’ve said it! And back to reviews again; I love reviews of any star-rating where the reader has clearly read the book thoughtfully, and has genuine opinions to offer about plot, characterisation, theme. On Amazon the healthiest star-rating profile is a triangle with its broad side at the top. I am afraid I feel suspicious of books that have only five stars. Also I am often attracted to the one star reviews. I want to know, “What is the worst that can be said about this novel?” And, quixotically, some of the things said by the one star reviewers make me want to read the book. Human opinions are incredibly diverse, especially about books, and we must all respect that. 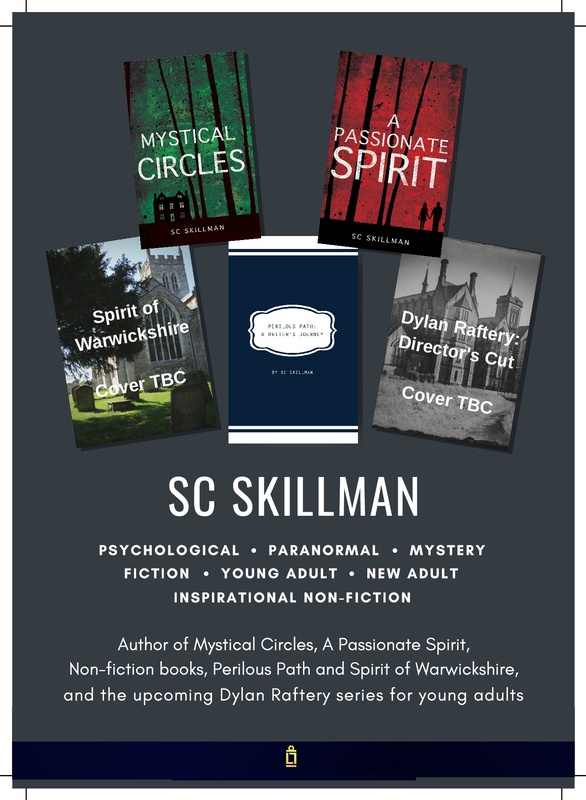 On 1st September at the beginning of my Mystical Circles blog tour, author and blogger Sacha Black hosted a guest post from me on her blog. Lest we forget, what started all this was a desire to create fiction, to bring people to life who never existed, to dream up worlds for them to inhabit, and sometimes to find that ‘they come alive. They are capable of the surprising act or word. They stand outside the plot, unconditioned by it’. And then there are other characters ‘who have to be pushed around…. have the obstinacy of nonexistence…..are inextricably bound to the plot… whose only importance is to… help to furnish the scene in which a living character moves and speaks,” as Graham Greene explained so eloquently in his novel The End of the Affair.One thing’s for sure; you will need to try to hold onto your sanity, so you may need your drug of choice – whether that be herbal calming tablets, or numerous infusions of caffeine, or glasses of wine, or, probably the least advisable substance of all, cakes and biscuits, to keep you going. For you will also have to master how to put out Facebook ads, and how to drive people to your mailing list sign-up forms, and monitor the response you get, and adjust your ads accordingly.